Danish Army Specific: Only a single Amazon made it´s way to the Danish Army. The vehicle was was taken over from the Danish Police on Cyprus (UNCIVPOL), when they were withdrawn from the island in 1975. 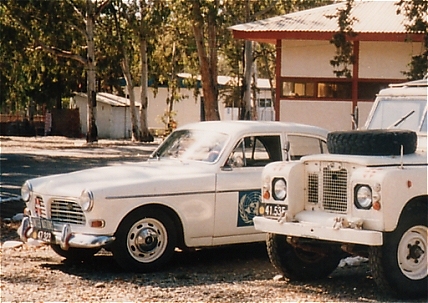 The shown vehicle, which is a 1966 model, was probably used by the staff at the Danish forces on Cyprus (DANCON/UNFICYP). Historical: The 121 four-door saloon was introduced in September 1956. It was fitted with a 60bhp B16A engine and had a two-tone colour scheme. In December 1957 the 5.000th car is completed. In March 1958 the 122 was introduced. It had a B18B engine with twin SU carburettors, 85 bhp and four-speed gearbox. In August front three-point seat belts are introduced as standard. In August 1961 a new engine, the B18, was fitted. The single carburettor version B18A (a Zenith) produced 75bhp. The B 18D with twin SU carburettors 90bhp at 5.000 rpm. 12 volt electric's and an up-rated front suspension were introduced. The 122S with the more powerful engine was fitted with front disc brakes. A Two-door saloon came in October 1961, and in February 1962 the 220 estate car were introduced in Sweden. In February 1963 the 100.000th car were built, and in August 1963 an automatic fitted with a three-speed Borg Warner box were introduced. The 123GT were introduced in August 1966. It was a two-door fitted with the 115bhp B18B engine from the P1800 sports car. It came with four-speed gearbox and overdrive, rev counter, fog and spotlights, wing mirrors, a P1800 type steering wheel along with new wheel trims. In December 1967 the production of four-door saloon was discontinued in favour of the new 140-series. In August 1968 the B20 engines (1998cc) were introduced. The B20A had a single carburettor and developed 90bhp. The twin carburettor B20B developed 118bhp. The estate was discontinued in August 1969. The remaining range was only two-door saloons with either engine option. In July 1970 when production of the 120-series seized, a total of 667.325 vehicles had been produced. Width: 1.62 m (63 inches). Weight: 1.550 kg (3.410 lb.). Engine: Own 4-cylinder, 1.778 cm3 (108 cubic inches) liquid cooled. Fuel capacity: 45 liter (9.9 gallons). Additional: Amazon was the first name given to the 120-series. Later Volvo had to drop the name because the rights had been already given to Kreidler, a German motor-cycle factory.